I have to admit I feel a little gypped. My polling place ran out of stickers. My kids were disappointed, too. All I got was this piece of paper vouching that I voted, "in case I want my free Starbucks". Maybe I'll just pin it to my chest. I feel this nervousness in my stomach today. Feel like we're all "on hold" or something. I cannot imagine what McCain and Obama feel like on a day like today. I think I'd want to lock myself up in a room with a TV. Meanwhile, I'm embracing the seasons. The girls and I carved pumpkins last week, of course. And if you notice a certain someone who has been very shy in the past, is quickly overcoming his fears. 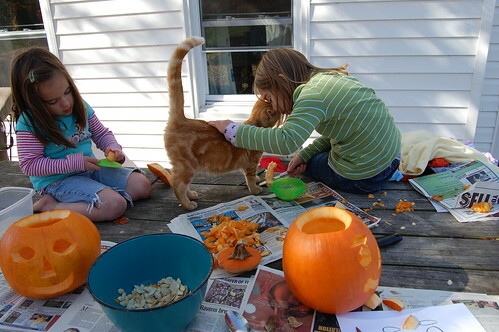 As far as I am concerned the girls can carve all they want, I just want the seeds. I get a little crazy about it. Picking through, making sure they don't miss any. Even picking up the stragglers that fall onto the ground. Oh so good. I'm also slowly burning my family out on apple crisp. I never follow any real recipe, just throw in a bunch of stuff that sounds good. Last night I got a little heavy-handed with the cinnamon, which made the apples get very dark and, well, cinnamon-y. It was good. I needed a little success after the caramel incident. And by the way, thanks to those that pointed out the recipe called for butterscotch chips *not* caramel. Oh those stinkin' little details. And on a more serious note, I also wanted to remind you to check out two new important links. The first, is Amanda's new project at Mama to Mama. I love Amanda's thought behind it, " to make a small but meaningful difference in one person's life through a simple act of crafting with intention." 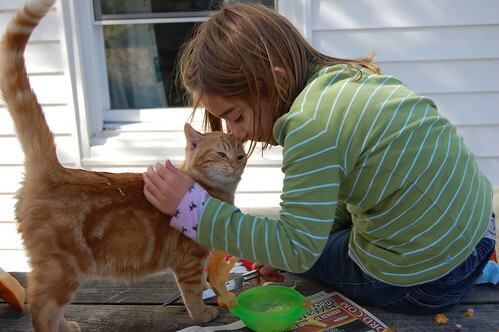 If you have a moment, spend some time reading about what Amanda is doing. It is wonderful. The other link I wanted to point your attention to is from a new to me site called Mom Advice. Amy and I follow each other on twitter. (Do you use twitter? You should. I am newly addicted. Get on there, let me know you're there. We can follow each other.) And I heard about her new Big Give. It is an amazing example of using your presence and influence online or in blogging for good. Amy, your post and your work for the Faith Mission is inspiring. I have some new ideas I'm working on for the coming months. So stay tuned. One involves an amazing giveaway. I can't wait to tell you!! 🙂 More to come soon…. mmm. I love pumpkin seeds. I have two big pumpkins still that we can dig out. Maybe I’ll do that tomorrow. Along with apple crisp. Can you ever have enough apple crisp? 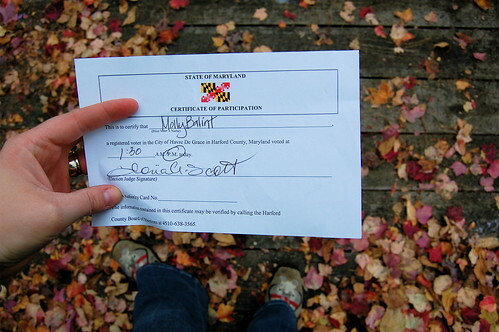 I live in maryland and I didn’t get a certificate of participation. now I feel gypped! I can’t vote since I’m a Canadian citizen so I feel a little on the outside of things. I’m a bit on edge, too. I’m on Twitter! I’m CanadianSheila if you want to follow me. We dont get stickers (at least not here in Madison, WI) which I think is a bummer. And ditto Twitter, I dont know all of its ins and outs yet but I am quickly getting addicted. You can find me as artsymomma if you want to add me, I will be sure to add you back! You are too sweet! Thank you so much for letting everyone know about the big gift. I just adore your photography- so beautiful & rich. Those pumpkin seeds look soooo yummy too. I need to do that still! Pumpkin seeds – may I ask how you prepare yours? This year we tried two new ways. We usually just toast in the oven. One way was to boil them for 5 min and then put them in the oven to toast and the second way was to just toaste them in a cast iron skillet. Both turned out okay but the boiled seeds were actually a little better at first but the next day they were a little too chewy. We also tried putting on a little soy sauce for the first time. I found these suggestions on epicurious.com. 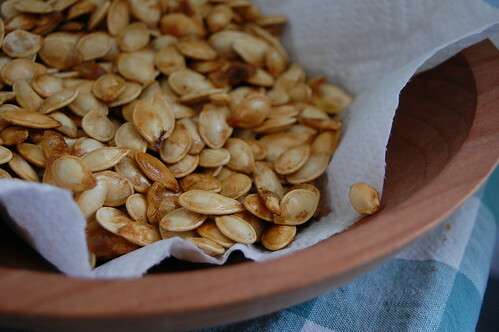 I am still uncertain about the best way to prepare pumpkin seeds and since you love them so very much, I thought I’d ask you about your favorite way. Any way, they are quite good! We took Isabel to vote with us, and not only did we not get stickers, she puked in the hallway on the way out. Not fun. Excited for trying pumpkin seeds. I’ve been putting it in my granola. I’d love it if you would join the recipe swap on my blog! Also… I’m excited about Mama to Mama as well. I have all my t-shirts ready! I agree…pins and needles. The air feels electric tonight. 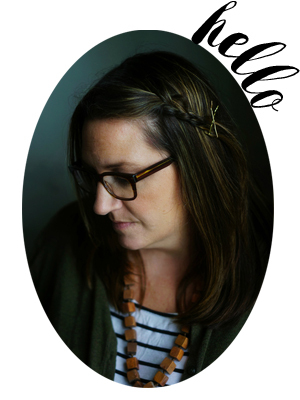 Amanda’s Mama to Mama project is so cool to me- I’ve wanted to be more intentional for a while, but was a bit at a loss as to *what* to do. So cool. I’ll have to check out that second link! I am jealous of your certificate. All I got was a measly sticker. He he he he. I find it incredible that voting is not compulsory, and is opn a weekday! Here (in Australia) it’s compulsory, on a weekend so work isn’t an issue, and there’s never more than a 10-minute wait. And watch on the heavy-handedness of the cinnamon; it was on one of those occasions my mother mistakenly substituted the cayenne. A little extra cinnamon turned into extra fire in the mouth! Looking forward to your new project! We were gypped at our polling place also – no stickers. But bringing Jake into the booth with me and letting him pull the levers was so thrilling for both of us that it hardly mattered! I didn’t get a sticker either and I was looking forward to getting one all day! I felt that same nervousness in my stomach all day while waiting for the results…and then it only got worse once the results were announced, lol! 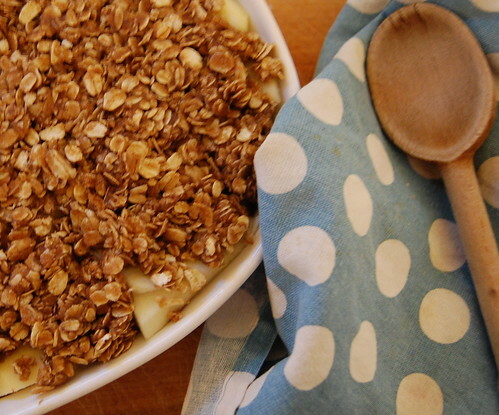 Pumpkin seeds and apple crisp…oh, fall, sweet fall! Don’t ya just love this time of year?! I get the feeling… the sticker is the coolest part! Our precinct was out of stickers, too. Waaahh! I didn’t even get the paper, but then I don’t drink coffee. Lol. I am on twitter (whitetshirts). I tried to find you, but no luck!